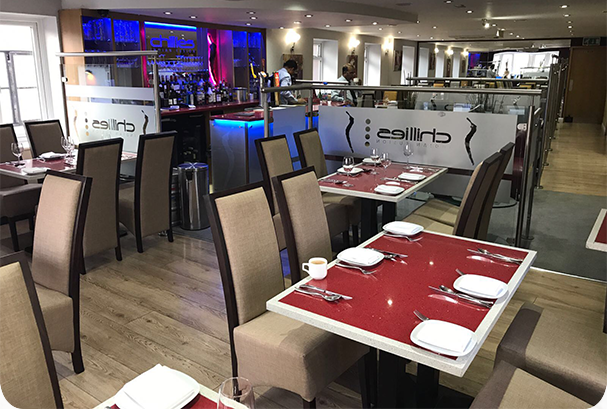 Click the Categories to open the menu or you can download the menu by clicking here for those looking to enjoy the full experience of Chillies Indian Fusion, please download our menu for dining in here. Probably the most authentic dish recognised in the UK originated deep in the Indian suburbs. Main ingredients are marinated in a sauce and individually cooked in an Indian style wok with onions, capsicum and coriander. Tailored to perfection. Served as two half portions to enable you to sample two dishes. This method of cooking is an ancient art handed down through many generations and is a speciality of our chef's. All tandoori dishes are cooked over charcoal in individual portions in a traditional oven made of special clay so the full flavour of the meat and spices are retained for your enjoyment. Tender pieces of meat delicately spiced and pan fried with pilau rice and served with a vegetable curry sauce. Thoroughly garnished with onions, tomatoes and a touch of selected spices. Mildy cooked with coconut powder and cream for rich creamy taste. Cooked with diced green peppers, onions and fresh spices for a spicy taste. Cooked with lentils, spices and fresh herbs with a touch of green pepper producing a hot and sour dish. Cooked in a medium spiced sauce with fresh spices for a hot, sweet and sour taste. A special preparation with garlic, garnished with tomatoes and spices. A traditional curd cheese used in Bangladeshi & Indian Cuisine. A classic taste to compliment any dish. Cooked with spinach and fresh herbs for a mouth watering medium flavoured dish. Both of these are hot dishes, lavishly prepared with hot spices. Curry dishes are cooked in a standard curry sauce with selected herbs and spices. Prepared with lychees/banana, coconut and mild spices in rich creamy sauce. 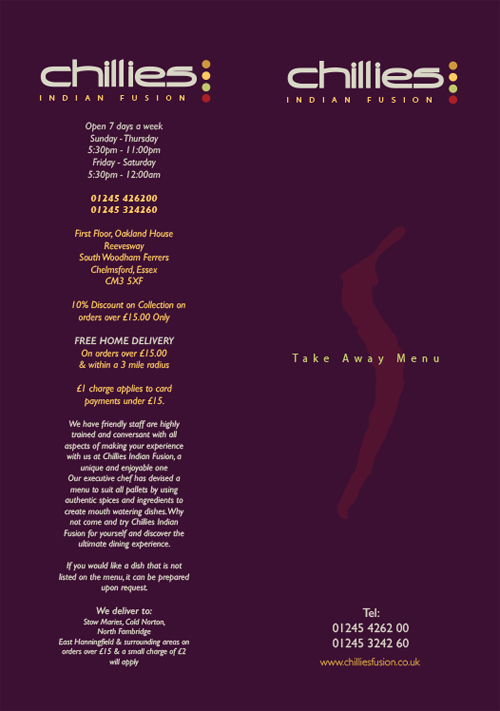 We can create any dishes from our main menu substituting meat with either Quorn or Tofu. All our Vegan dishes are cooked with Dairy Free ingredients. If in doubt please aks. Priced as Traditional Main courses. Served with fresh green salad and chips.